My Hamilton obsession turned into a Revolutionary War fixation. I ended up marathoning Turn on Netflix. So when this audiobook came through my hands at the bookdrop, I had to give it a go. I must admit that I did yell "HERCULES MULLIGAN!" and sing "Alexander Hamilton!" and shout out "Lafayette!" at all the appropriate places. I also found it enjoyable to see how much the television show took from reality. I enjoyed getting to know the real figures from history and their adventures. And now I finally found out why the ring was called Culper! The book did a great job of delving into the identities and workings of the ring members. I had no idea about a lot of their exploits, including the counterfeiting ring exposure and helping to expose Benedict Arnold. 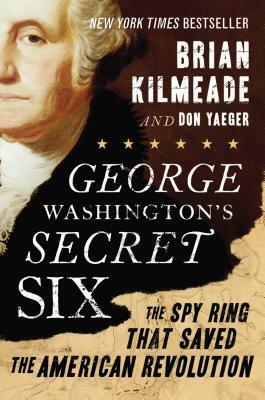 I also loved to hear about Hamilton's role in that, as well as the fact that he decoded messages for Washington. I really enjoyed hearing about them developing techniques, figuring out how to expand the ring, and taking advantage of certain situations. It was honorable but tragic that some of the ring members were still labeled as loyalists after the war and couldn't tell anyone how they made the victory possible. The reader, one of the authors, was okay as a reader. But he was always SUPER EXCITED ABOUT EVERY SENTENCE! It was a little hard to listen to for the whole book. It was kind of sweet how excited he was about the subject matter, though.